Seattle and King County rushed to help homeless people caught in the winter storm that blanketed the region, adding temporary day centers and about 150 temporary shelter beds while handing out items for those who chose to brave the cold and sleep outside. But other efforts to reach the estimated 6,300 people living unsheltered in King County at any given time were grounded because of the harsh conditions. 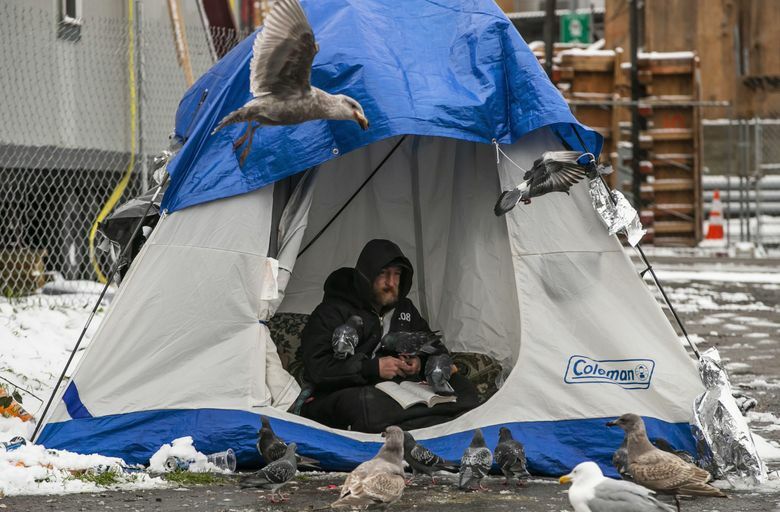 Seattle’s Navigation Team, an outreach group that regularly visits the city’s hundreds of unauthorized encampments, couldn’t operate Monday because not enough team members were able to get to work, said Seattle Police Department Sgt. Eric Zerr. Many people still found their way to the shelter spaces made available in the wake of the snow. Clyde Coberly, 63, was one of about 40 people sitting in the Seattle Center Armory on Monday afternoon with bags, backpacks and suitcases. Seattle announced early Monday it had opened a day shelter at the Armory that would stay open through Saturday, said Deborah Daoust, the center’s director of communications. Coberly stays at a nearby overnight shelter and frequently comes to the armory to stay warm. This is his third winter in Seattle, and he wasn’t unnerved by the snow. The city had already opened a temporary overnight shelter in the Seattle Center Exhibition Hall on Sunday night, with room for about 90 to 100 adults. Forty-eight people stayed there Sunday night, said Meg Olberding, spokesperson for the city’s Human Services Department. It will remain open through Feb. 10. King County officials added 50 extra shelter beds at its Administration Building through Wednesday night and set up day shelter space at the Jefferson Day Center. Generally, people are more open to taking shelter, even if it’s just short term, when temperatures drop this low, said Brian Chandler, director of outreach for the Union Gospel Mission. The Mission’s overnight men’s shelter downtown was above capacity Sunday night; agency staffers added 30 shelter beds on the third floor, in addition to the normal 177 available. UGM’s Kent Hope Women’s overnight shelter was also at capacity Sunday, at 25. Mary’s Place, which operates the county’s community emergency family shelter intake line, normally has to turn away families for space. But on Sunday night, the organization found a way to get everyone sheltered, said Mary’s Place chief communications officer Linda Mitchell. They planned to do the same again Monday night. Some workers with Operation Sack Lunch, which provides 3,000 meals to homeless people, had commutes that stretched up to two or three hours, said Executive Director Beverly Graham. They still planned to provide that many meals on Monday, but “it’s just going to be a little slippier,” Graham said. She expected an uptick in people coming for food at the organization’s outdoor meal site downtown because they will make their way over from unsanctioned encampments after they can’t get food anywhere else. All programs at facilities run by the Downtown Emergency Service Center and Compass Housing Alliance, two of the region’s largest homeless service providers, were operating Monday. But they also experienced a surge in clientele. Compass’ day center on Rainier Avenue South was “overwhelmed” Monday morning, said agency CEO Janet Pope. About 25 people were waiting outside the door of the Chief Seattle Club before 7 a.m. Monday, waiting for the site to open, said Colleen Chalmers, the club program manager. The club planned to stay open four hours later than usual Monday. Anticipating the cold, club employees bought extra sleeping bags and tarps Friday. They planned to buy more today. 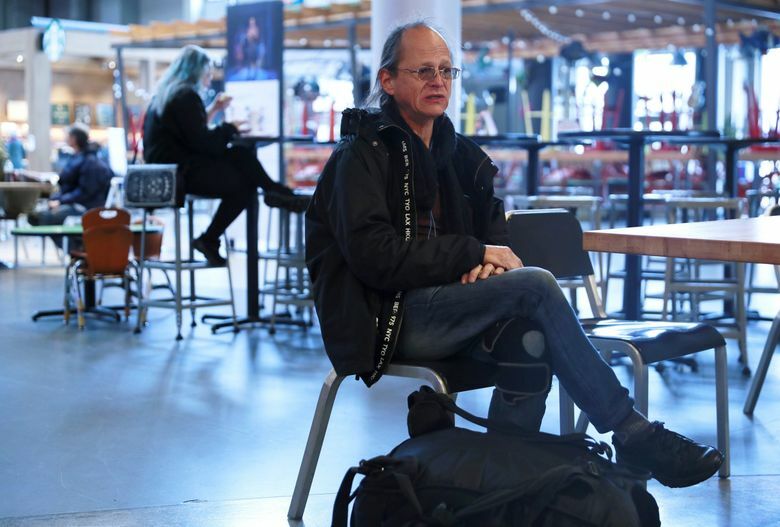 The club also prints out updated shelter lists, but often their members — who are primarily Native American — won’t go to the large shelters, like the ones at the Seattle Center, because they aren’t Native-led and so they don’t feel accepted there, Chalmers said. “To some of our members, it snowing is not as much of a danger as some of what they feel in a shelter,” she said. Distance can also be a barrier to shelter. Lisa Etter Carlson, co-founder of the drop-in center Aurora Commons, was skeptical that any of her clientele, men and women that live along North Aurora, would make it from there to the Seattle Center shelters. Many don’t have bus passes or can’t afford one. Or, they simply feel safer in their neighborhood. “It’s an area they’re not familiar with, it’s an area they don’t feel safe in, they don’t feel known in,” Etter Carlson said. All throughout Monday, neighbors from the surrounding Licton Springs neighborhood and volunteers brought warm clothes and blankets to Aurora Commons. People hung out during the day there, but she worried what would happen to them after. One woman arrived at the center wearing flip-flops. But even those close to services might not always take them. Behavioral health issues can keep them outside, because, for example, they don’t feel safe in enclosed spaces, said Dennis Kelly, a volunteer with MercyWatch, which does street and medical outreach in Snohomish County. In Seattle, Russ “Shadow” Morisch, 45, spent the early afternoon sitting in a six-person tent tied down near the bus stop at the intersection of Denny and Aurora, reading a novel. Wind whipped at the tent flaps, but Morsich said he was unbothered by the gusts. He wore hand warmers, a hoodie and a full-body thermal jacket, the kind worn by people working in refrigerated facilities. “I’m toasty,” he said. He planned to fasten a tarp to the tent using duct tape. His two friends, who shared the tent with him in previous days, left to go panhandle. Then they planned to head over to the Seattle Center overnight shelter. Morisch said he’d walk with them but would return to his tent.